Ride and find your freedom. 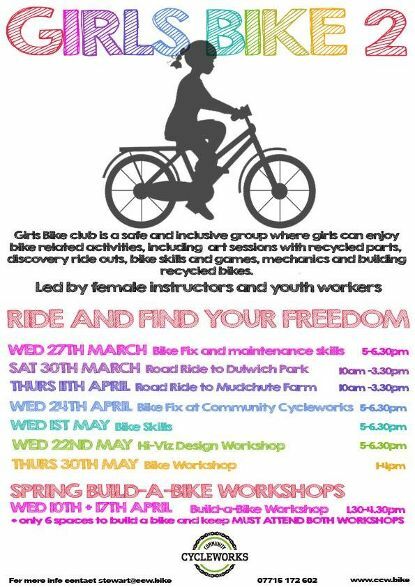 Community Cycleworks has a girls bike club and it’s got ride-outs, bike skills training and games plus art sessions with bike bits this Easter and spring. The club is based at CCW in Burgess Park on the ground floor of Giraffe House right by the BMX track. We’re a bit behind the times and we’ve missed the first two rides but you don’t need to miss the next ride (to Mudchute Farm) on April 11th, the Bike Fix on April 24th, bike skills on May 1st, the Hi-Viz design workshop on May 22nd and the bike workshop on May 30th.